If you are under 30 and aspire to make board-level decisions, Britannia Industries may be just the place for you. The `10,000 crore biscuit maker has a young management team that takes crucial decisions related to new product launches as well as categories the company should venture into. The team members also travel across the globe to understand trends and get ideas for Britannias product portfolio. Earlier this year, the company entered into a joint venture with a Greek company, Chipita SA, to make long shelf-life croissants with chocolate filling. The idea, says Varun Berry, Managing Director, came from this very team of managers. "They told us they are always in a hurry and need a snack which is filling, delightful, an on-the-go kind of an offering. To give it a more Indian context, they said they were looking for a healthier samosa-type option. After listening to them, I looked across the globe for partners who could help us create such a product and finally zeroed in on Chipita." The croissant facility is coming up near Pune. The product should be on shop shelves towards the end of 2018. Thanks to initiatives such as these, Britannia Industries, ever since Berry took over in 2013, has been registering an impressive revenue growth of 15 per cent. Profits have grown by close to 40 per cent a year in the last five years. Berry, 56, admits the company's stellar growth has been instrumental in attracting the young talent he is so proud of. "The biggest win has been the team. It's young, passionate and open to ideas. I don't think many companies can do so many things at the same time with such a tight team. That's my biggest pride." While a young team helps the company connect with consumers, 60 per cent of whom are below 30, Berry's people skills and ability to attract talent is well known. "Varun has the ability of spotting potential in people who are lost in the crowd. I am one of them," says Hemant Rupani, Director (Sales), Mondelez India, who was earlier head of sales at Britannia. The key to an FMCG company's success, apart from great products, is a robust distribution network, and that is exactly what Berry has been focusing on. He has been adding 2.5 lakh retail stores to the direct distribution network every year. "This year again, we will add 2.5 lakh outlets, so we will probably end up covering 17.5 lakh outlets directly. The difference in market share between where we go directly versus where we go through wholesalers is about 20 share points," says Berry. Of these, 13,200 are rural distributors. The company had just 1,000-odd rural distributors in 2013. Hindi-speaking markets have been a weak area. But Berry says they are now doing exceedingly well in these markets after strengthening the distribution network and selling the right products. "In the last two-three months, we have been facing shortages in these markets as our products are being sold out earlier than expected," claims Berry. Berry has also made the company much more cost conscious. Apart from ensuring that the distributors follow a 'zero days' inventory model, he also let go of third-party resources, both in sales and manufacturing. He replaced a lot of third-party manufacturing by building new plants in Gujarat and Orissa. "We continuously work on getting costs out of the system. The team, right to the frontline, is aware of our cost-conscious approach," points out Berry. Raghu Vishwanath, MD of brand valuation company Vertebrand, has two words to describe Berry - 'efficient' and 'effective'. "Berry has focused on getting the backend right rather than new launches. This has resulted in efficiencies in sales & distribution," he says. 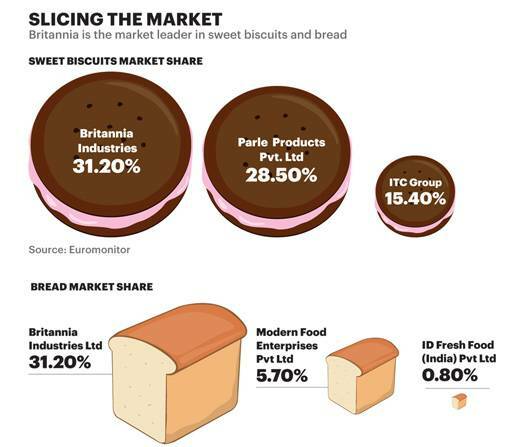 While biscuits, where Britannia is market leader, will continue to be the mainstay, the company is looking at growing in not just adjacent businesses such as breads, cakes and croissants (a `1,300 crore business, which Berry expects to grow by another `1,200 crore in the next couple of years), but also in dairy. Berry wants Britannia to become a total foods company. He has been talking about going back to the drawing board as far as his `400 crore dairy business is concerned for a while now, and that is finally seeing the light of day. The company is experimenting with milk collection in villages around Pune and would soon venture into value-added milk products. "To become big in the value-added milk space, it's important to have our own back-end. At present, we are just traders (the company's dairy products are outsourced)," he says. He plans to hire a high-profile CEO for the dairy business. "We are in talks with several European, American and Dutch companies for a possible partnership." Vishwanth of Vertebrand says Britannia is in a sweet spot as it has the distribution and supply chain in place. "The moment you fix the backend, you are on a stronger platform to get into joint ventures. The foundation is strong enough to move from second gear to fourth gear." The cookie major is also considering expanding its international footprint more aggressively. While 2018 will see a new manufacturing plant in Nepal, Berry's target is to enter a new geography every year (mostly emerging markets such as Myanmar, Bangladesh and African countries) from now on. Britannia Industries, under Varun Berry, is undoubtedly on a high. So, what sets it apart from other food companies, especially the multinationals? "Our P&L spine is such that our cost is very tight. The total margins in this category are nowhere compared to what MNCs are used to. These companies don't have the P&L spine to support a low gross margin product. We are structured such that we can support these as well as higher gross margin products," says Berry.